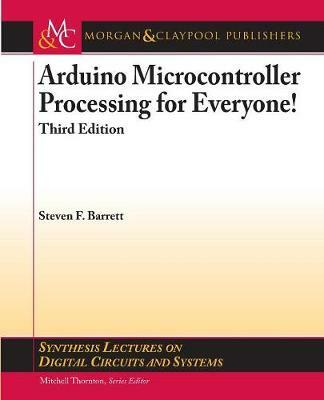 This book is about the Arduino microcontroller and the Arduino concept. The visionary Arduino team of Massimo Banzi, David Cuartielles, Tom Igoe, Gianluca Martino, and David Mellis launched a new innovation in microcontroller hardware in 2005, the concept of open source hardware. Their approach was to openly share details of microcontroller-based hardware design platforms to stimulate the sharing of ideas and promote innovation. This concept has been popular in the software world for many years. This book is intended for a wide variety of audiences including students of the fine arts, middle and senior high school students, engineering design students, and practicing scientists and engineers. To meet this wide audience, the book has been divided into sections to satisfy the need of each reader. The book contains many software and hardware examples to assist the reader in developing a wide variety of systems. The book covers two different Arduino products: the Arduino UNO R3 equipped with the Atmel ATmega328 and the Arduino Mega 2560 equipped with the Atmel ATmega2560. The third edition has been updated with the latest on these two processing boards, changes to the Arduino Development Environment and multiple extended examples.